Responsive web designs adjust the size and position of images, columns, and other elements based on the size of the browser window. Many web designers are calling 2013 The Year of Responsive Design. Responsive web design is increasingly popular because the biggest challenge of web design today is that your pages are as likely to be projected on a giant computer monitor as on a tiny cell phone screen. With responsive design, you create one web page that automatically adjusts to fit the size of a browser window, whether its a browser on an iPhone, and iPad, a 70-inch television screen, or any other device that may ever be used to view your web pages. 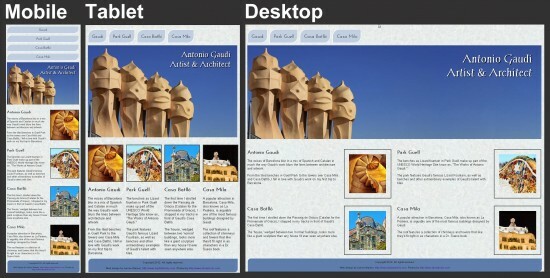 The best way to understand how responsive design works is to visit a website designed with this approach. Responsive designs respond to differences in the width of a browser window by fluidly adjusting the placement of elements on a web page to fit the available space. Thus, as you drag the side of a browser to make it larger or smaller, you’ll see the design change in real time. Visit the Antonio Gaudi website, which I designed to demonstrate how responsive design works, and drag the side of the browser window to make it smaller and larger and you’ll see how responsive design works. As you change the size of the browser, you’ll see the page layout change – columns get smaller, navigation links change position and size, and elements shift from side by site to one of top of another. Visit the same site on an iPhone, iPad, or other device with a small screen, and you will see just the design that is targeted to fit that size device, as you see in the image at the top of this page. Mobile layout: Targets CSS rules that apply when the browser window is 480 pixels and below. Tablet layout: Targets CSS rules that apply when the browser window is 481 to 768 pixels. This layout inherits all styles from the mobile layout and adds styles that to apply to the page only when the browser window is in the tablet size range. Desktop layout: Targets CSS rules that apply when the browser window is 769 to 1232 pixels. This layout inherits all styles from the mobile and tablet layouts and adds styles that apply to the page only when the browser window is in the desktop size range. 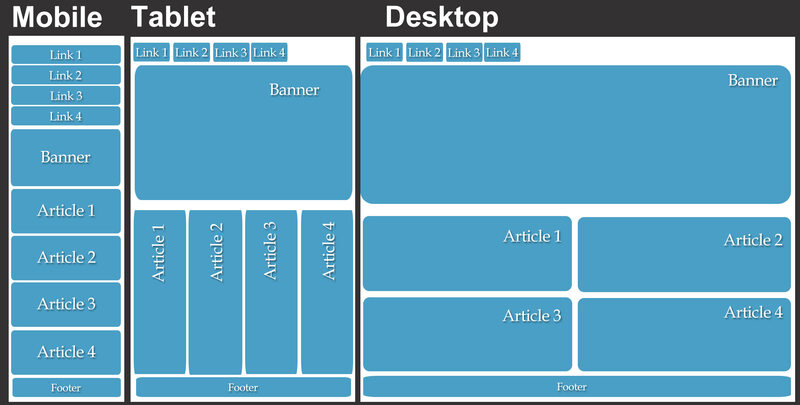 The two figures below represent a responsive website as it appears in a browser at each of these sizes, and the basic structure of the page that you see if you look at the code ‘behind the scenes’. Notice that the same HTML code is used to create the same number of links and articles and that the order of the elements remains the same. That’s because it’s just one HTML page that makes up the boxes in this design. Below you see how the design look with the images and text in place. 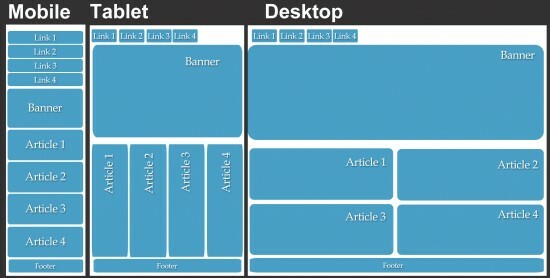 As you create layouts using responsive design, remember that you are not creating three completely different web pages. Instead, you’re creating one HTML file that can respond and adjust to fit each of the target screen sizes defined in the media queries. That means you need to position all <div> tags and other elements in your HTML document in a way that they can be reduced, enlarged, and rearranged to work in all three of the layouts you create. As a result, one of the biggest complexities as you develop responsive designs is coming up with a basic page structure that lends itself to working on all three screen sizes. What programs can you use to create responsive web designs? 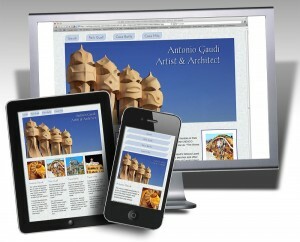 You can create responsive web designs using almost any program you can use to design websites. If you use WordPress, one of the most popular tools for creating websites and blogs, make sure you use a theme that is responsive. If you search for responsive WordPress themes, you’ll find a growing list of options, and you can always test any new theme by clicking and dragging your browser window to see the design adjust. To learn how to create a WordPress site with a responsive design, watch Janine’s new creativeLIVE course, “Creating Website the Easy Way with WordPress.” If you use a web design program, such as Adobe Dreamweaver, you can design the HTML and set up the CSS media queries yourself, or you can use the new fluid grid layout features include in Dreamweaver CS6. Order Janine’s Dreamweaver CS6 video to learn that approach. Explore the differences between adaptive and responsive web design. I was a CL web audience, why do you recommend wordpress instead of joomla? Hi Jaime, I have nothing against Joomla. I’ve used Joomla to build a couple of sites years ago, but I’ve since found that WordPress is a better option for me. I prefer WordPress because it is a far more popular program (nearly 20% of all websites are now built with WordPress, only a small percentage are built with Joomla). As a result, there are more themes, more plugins, and more support for WordPress. In short, there is a much more robust community and many more places to get help and resources for WordPress so I prefer to use it and I feel more confident teaching other people about WordPress because I know they can get help from many other sources as well. when adding a scrollbar in Menu , its working on samsung mobile with responsive design but not working on windows mobile with same css resolution. Please advice me. when adding a scrollbar in Menu , its working on samsung mobile with responsive design but not working on windows mobile with same css resolution. The resolution is 360×640.